Apple’s operating system for mobile devices, known as IOS, includes a number of accessibility features designed to make these devices easier to use for people with disabilities. 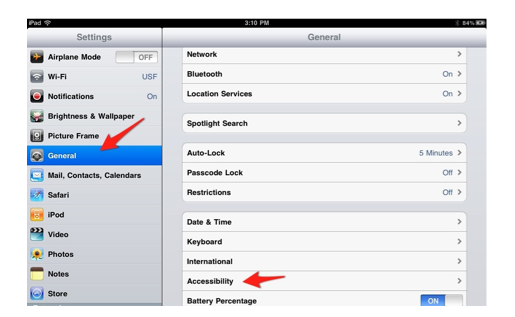 The accessibility settings for IOS can be found in the Settings app. After you open the Settings app, choose General, Accessibility. VoiceOver: reads the contents of the screen to someone who has a visual impairment. Zoom: will magnify the contents of the screen to make it easier to see for someone with low vision. Large Text: makes the text bigger in some built-in applications such as Mail, Contacts and Notes. White on Black: reverses the colors on the screen to provide higher contrast and reduce eye strain. Mono Audio: converts a stereo signal so that both channels play in each earpiece when someone uses the device with headphones. This feature can be helpful to someone who has unilateral hearing loss. Speak Auto-text: will speak the text suggested by the auto-correction feature using the system voice. Turning on some of these features, such as Mono Audio or White on Black, will only require you to tap an On/Off switch. 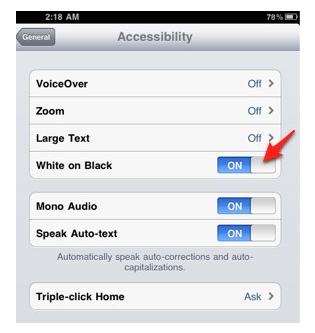 On/Off switch for White on Black highlighted in Accessibility options screen. 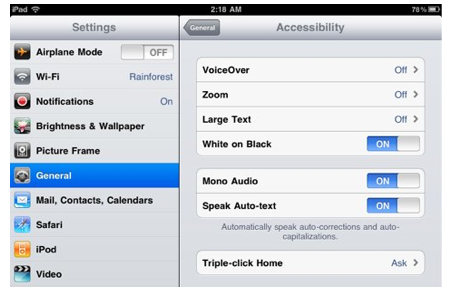 With others, such as VoiceOver and Zoom, you will need to tap the name of the feature under General, Accessibility to access a separate menu with additional preferences. 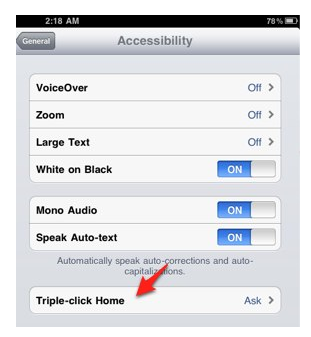 A much quicker way to turn any of the accessibility features on/off is to use the Triple-click Home shortcut. To enable the Triple-click home shortcut, open the Settings app and choose General, Accessibility, then tap Triple-click Home. Off: to disable the shortcut. Toggle VoiceOver: to toggle the VoiceOver screen reader on/off. Toggle White on Black: to reverse the colors on the screen and use a high contrast display. Triple-clicking the Home button a second time will turn this feature off. Ask: will bring up when a popup menu when you triple-click Home. 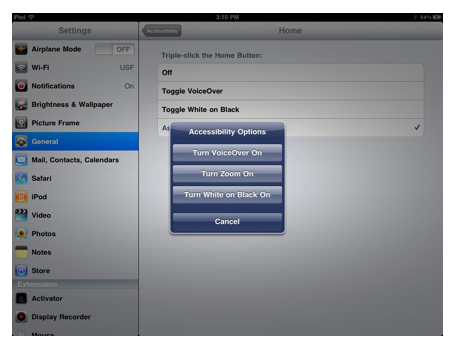 From this menu, you can choose to Toggle VoiceOver, Zoom or White on Black.